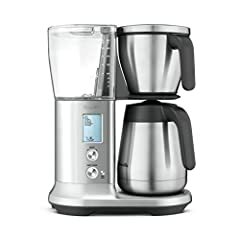 Gail, how would you compare this to the TechniVorm Moccamaster? Great review thanks. I am now on the fence as to which to choose. Please advise. Do you know who sells this in Canada? Looks like the perfect all purpose machine. What do you recommend to keep the inner workings clean? just got mine. Thanks for the review Gail! as a coffee snob, by biggest gripe is all the plastic and metal used in these machines. ceramic or glass IMO gives the cleanest taste. i would love and old school percolator all ceramic or glass. this machine looks super enticing though. Well, I have had the Brevelle Precision Brewer for four week and I just want to tell you that by far, it is making the best coffee I have ever had at home. I roast my own coffee and we take our coffee passion very seriously. So far I have used the one cup, gold, and my brew options. We had a large family gathering this past weekend and the gold got the most votes as number one, with my brew coming in a close second. Well worth the investment. That’s a lot of features for one machine! What is the price point for this beast? Will it support other pour overs besides the Hario? I have a Beehouse and was wondering. I looked at the price and went, “Wow!” It is worth the price. If you have a giveaway, I’m in. How many years is it good for if you are brewing a pot every day or so? Hi there! I have been loving your youtube videos for ages and have been studying espresso for ages. I have talked and worked with many baristas in my area but actually do not own a mashine. I am currently still in school and cannot really spend 500 or more on a mashine. I have saved up for a while and was looking at the gaggia classic. The problem, however is that I cant get the american version, I live in South Africa. I would like a mashine that offers traditional brewing and steaming methods (for example non-pressurised filter) and something that I can ask a local supplier to import. I love the features of the breville but have heard many quality complaints about it. What is your recomendation for a young coffee geek in need of a quality budget mashine? Breville is coming out with a lot of cool new stuff! Can you do a video demo of the v60 function? My Breville Precision Brewer worked great for a month then when it was set on “Gold” began heating for only 5-8 seconds, skipped the “blooming” cycle, and went straight to the “brew” cycle. I got a replacement machine and it did the same thing the first time it was used. Any suggestions would be welcome as to how to get it to heat longer and to bloom appropriately before brewing. Great machine, great review! 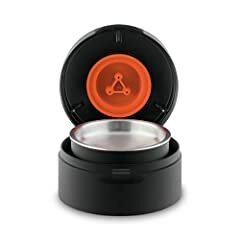 Would be great if you could review how it does cold brew and pour overs. The Brazen does the pour over? Looks really great! Love that flat, even bed after the brew. Would love to see it do a V60 or a Kalita… I feel like the physical pour overs (those anyway) are too small for that brew head but we’ll see! I love this Lady for some reason…. Great reviews! True coffee heads will not have an “auto” set because of roast>>grind>>brew flavor. I know of at least one other “drip” machine that will do the v60 method – the Behmor Connected or Behmor Brazen. It will also allow for a Chemex and a French Press to fit under the shower head. can you do a comparison of this verses the Technivorm with thermal craft. and include a brew review of the Gold cup brew of each machine? Wanna see the pour over please! 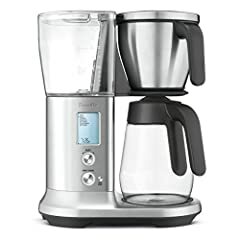 Nice brewer–Love Breville! I am a proud Technivorm owner. Can you do a comparison of the two? Can you update as regards “cold” brew, will it be renamed ie, cool brew, or will the machines be recalibrated to deliver cold water instead of heating before being left to steep ? Regarding the paper filter size, same as the moccamaster grand? I’ve had this machine since it came out and LOVE it!! I hate carafes. I won’t have one. It’s like all the ideas of the Ninja Coffee Bar without the terrible weak coffee. SCA guidelines for temp are 195-205. But for a lot of people that manually brew (V60, Chemex, French Press, etc) often prefer to go up to even as hot as straight off boiling where the water is near 212 F. Are there any machines that allow you to go that high? Curious if the option to go that high would disqualify for SCA approval. But I don’t think I could switch to a machine that didn’t let me brew anywhere from 180-210 F.
I saw in the other video on this that the hot plate keeps the brewed pot at the selected brewing temp; or can you adjust the temp it keeps it at? I think I’d prefer to keep it at a lower, ready-to-drink temp personally. It’s also interesting that with single serve pour over that it holds the water back/doesn’t let it drain. That’s kind of the point of V60 to allow it to drain continually instead of just immersing it. All those pour over cones are designed so that they control their own drain rate (and the V60 lets you control it by changing the grind size). Holding it back means you have to grind coarser and it really changes the whole method for pour over.